After a line of Harry Potter inspired makeup products including a feather quill liquid eyeliner and wand makeup brushes, Storybook Cosmetics brings a brand new palette straight out of the world of magic. 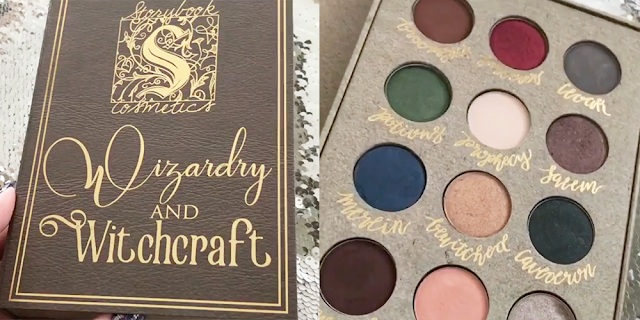 The Storybook Cosmetics Wizardry and Witchcraft palette comes as a thick text book of magic, which Madam Pince would certainly keep in the restricted section of the library, and has a vintage feel to it with its gold lettering and whimsical font. The palette offers a dozen eyeshadows inspired from the Hogwarts School of Witchcraft and Wizardry, with quirky names, and includes a mirror as well. With a vast variety of colours, the palette can be used to create numerous makeup looks, from magical vivacious and bold ones to soft and neutral ones for the day.